Jeff Stephenson gives a presentation on the Rio Tinto Adobe Rock development at the Tooele County Chamber of Commerce luncheon on Monday afternoon at the USU Science and Tech Building. Jason Stout and Adam Kowalk talk about a slide showing the Rio Tinto Adobe Rock development plan before a Tooele County Chamber of Commerce luncheon on Monday afternoon. 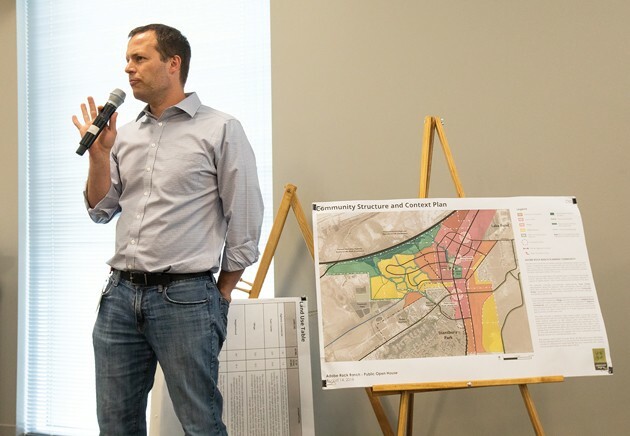 With 19 months left before an election that may decide the fate of Kennecott’s plan to build a planned community in Tooele Valley, a company official promoted the project and answered questions at a meeting in Tooele City on Monday. 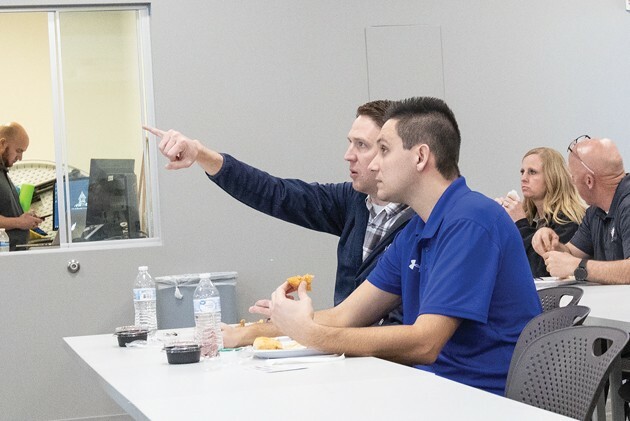 Jeff Stephenson, a representative of Kennecott, spoke about his company’s 1,444-acre Adobe Rock Ranch project during a luncheon held by the Tooele County Chamber of Commerce and Tourism at Utah State University – Tooele Science and Technology building. The Tooele County Planning Commission recommended, and the County Commission approved, a rezone request from Kennecott for the property the company owns in the Lake Point area around Adobe Rock, across state Route 36 to Interstate 80 and south to Stansbury Park. The rezone changed the 1,444 acres from a mix of agricultural, rural residential, manufacturing and multiple uses to a planned community. 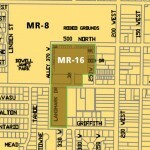 The rezone was approved in October 2018. The County Commission approved the master development agreement for Adobe Rock Ranch in December 2018. 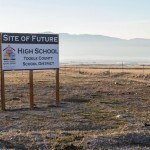 However, Tooele County residents opposed to the Adobe Rock Ranch development were successful in gathering enough signatures to place the rezone on the November 2020 ballot. Adobe Rock Ranch would add 4,710 residential units to northeastern Tooele Valley with an average density of 3.3 units per acre. The development would include a variety of commercial, retail, and open space over a 20-25 year period, according to Stephenson. Documents submitted by Kennecott, along with its rezone request application, show plans for 20 acres of Adobe Rock Ranch to be developed as highway commercial with a wide range of commercial, light industrial and flex-type uses with no residences. There would be 359 acres designated as “town center,” as described in Tooele County’s land use ordinance. Adobe Rock Ranch’s town center area would have a mix of residential, office, commercial and similar uses. Uses in the town center may be mixed vertically or horizontally, with 30% of the acreage to be dedicated to trails, open space, local parks, etc. Housing in the town center would average seven units per acre, according to Kennecott’s application. A total of 263 acres would be developed as “village,” another broad designation of land use included in the county’s planned development zone. The village designated area would have a range of higher-density housing types, including townhomes, apartments and condominiums, again with 30% of the acreage assumed to be dedicated to trails, open space, local parks with an average density of five units per acre. Another 441 acres would be developed as “neighborhood,” as defined in Tooele County’s land use ordinance. In the neighborhood area, single-family residences would take on a variety of forms, styles and densities, all laid out in coordinated neighborhoods. The net density would average two units per acre laid out in clustered development. In the neighborhood, 30% of the acreage would be dedicated to trails, open space, local parks, according to Kennecott’s approved plans. Adobe Rock Ranch would have 361 acres of primary park space including natural lands, major trail corridors, and two major parks — at the factory ruins and Adobe Rock. Smaller parks, trails, and open space will be included in the plans for the other land uses. Stephenson opened his presentation by answering what he said were the top two concerns he hears about — water and transportation. Stephenson implied that if Kennecott didn’t own enough water in Tooele, the company would pipe water the company already owns rights to into Tooele Valley from Salt Lake County. 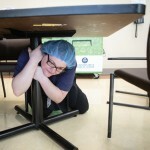 “There may not be a shortage of water, but there might be a shortage of cheap water,” Stephenson said. When it comes to traffic, Stephenson said Kennecott is already working with the Utah Department of Transportation on a regional traffic plan for Tooele County. While completing other developments in Salt Lake County, Kennecott has had experience in working with UDOT to accelerate the building of off ramps and advancing the environmental impact study for the Mountain View Corridor project. They also worked with the Utah Transit Authority to bring Trax to Daybreak, Stephenson said. Stephenson said Kennecott worked with UDOT on the Midvalley Highway project, selling property to UDOT for the exit from I-80. Kennecott will also cooperate with Tooele County and UDOT on plans for the extension of state Route 201 into Tooele County, he said. Adobe Rock Ranch will be a planned development which, like Daybreak, will be a well planned community with trails and parks, according to Stephenson. But there are some differences between the two planned communities, he said. Adobe Rock Ranch is at an average density of 3.3 residences per acre while Daybreak averages close to six units per acre. Adobe Rock Ranch will have 4,700 residential units at buildout. Daybreak is planned to have 20,000 units at build out. “That’s half the density and one-fourth the size of Daybreak,” Stephenson said. Overall, Adobe Rock Ranch would house 2.5% of the population growth of the state as projected by the Kem Gardner Institute, according to Stephenson. Stephenson said work on Adobe Rock Ranch is on hold until the 2020 election; however, Kennecott is looking at recent legislation passed by the state Legislature to see if it might offer some opportunity for Kennecott to move forward with planning for Adobe Rock Ranch prior to the 2020 election, he said. Petitioners turned in 3,572 signatures to place the Adobe Rock Ranch rezone on the 2020 election ballot. The Tooele County Clerk stopped verifying signatures after reaching 2,765 because only 2,749 signatures were needed.